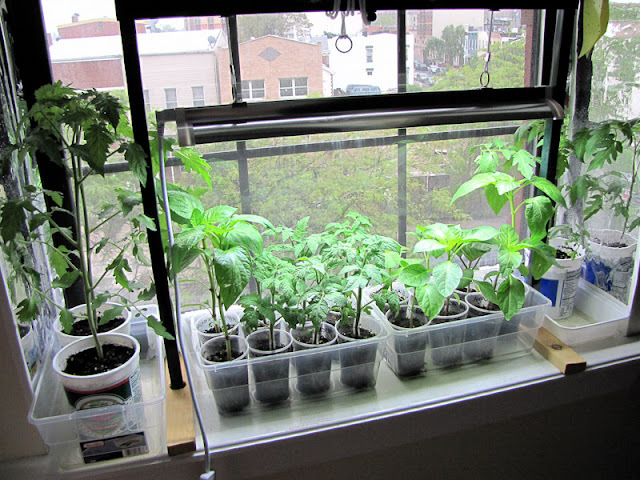 The windowsill is at capacity, I can't wait to plant these guys outside! 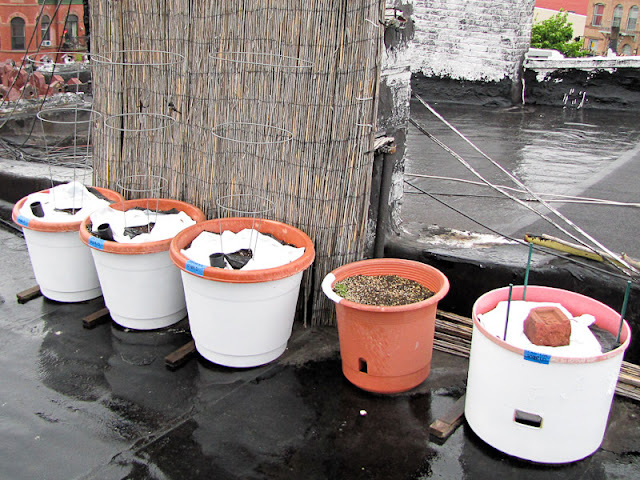 The rooftop is ready for them, all containers have been fertilized, mulched and caged/staked. The mulch is actually 2 layers, the base layer is black to block weed growth and the top layer is white to reduce heat retention. Last year I only used a white layer and had a problem with light penetration. At the end of the season I removed the mulch and found small weeds and moss growing under the plastic. 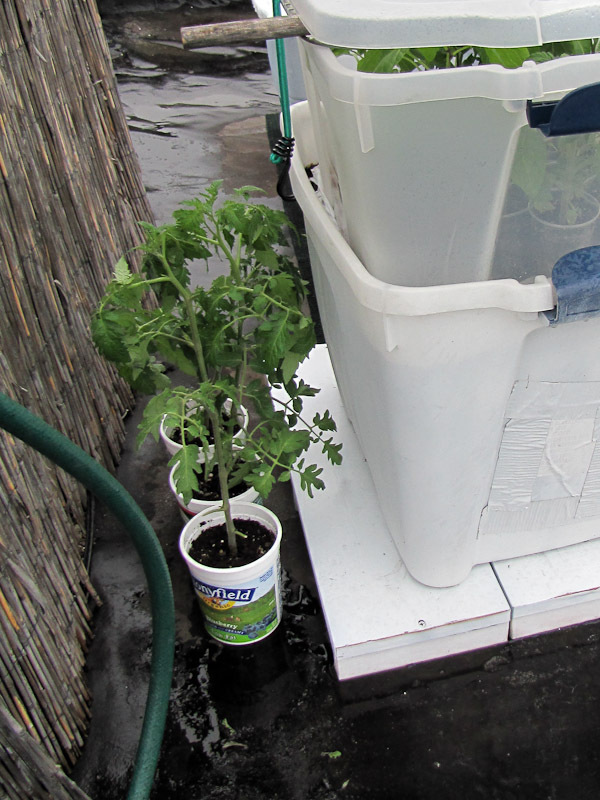 The seedlings are usually more exposed to the elements, but during the day when there is rain in the forecast, and I'm away from the apartment, I don't want to risk a freak thunderstorm drowning the plants, so they stay covered until I return. Once I get back everything comes off, even if it's raining. If it is raining I just go up every once in a while and drain the trays so they're not sitting in a pool of water. The larger tomato plants in the yogurt tubs don't fit in the greenhouse so they are tucked behind the greenhouse next to the chimney. With protection on 2 sides I'm comfortable leaving them outside while I'm away. When I'm home I move them to a more exposed location. The seedlings spend most of their time outside, I only take them in at night. 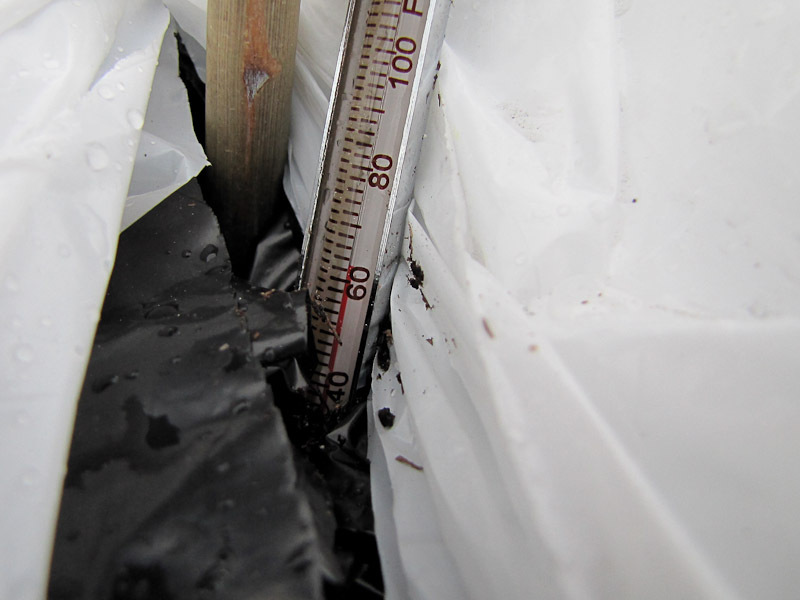 Not anymore though, the next few nights will be overnight in the mini greenhouse. Soil temperature is up to 62 degrees. I would be okay with planting tomatoes now, but mine aren't ready for prime time yet. Definitely by this weekend though. Have you planted outside yet? Looking good! Across the river from you in Manhattan, my plants were all in last week. (Hopefully not too early..) So far so good. Cheers! 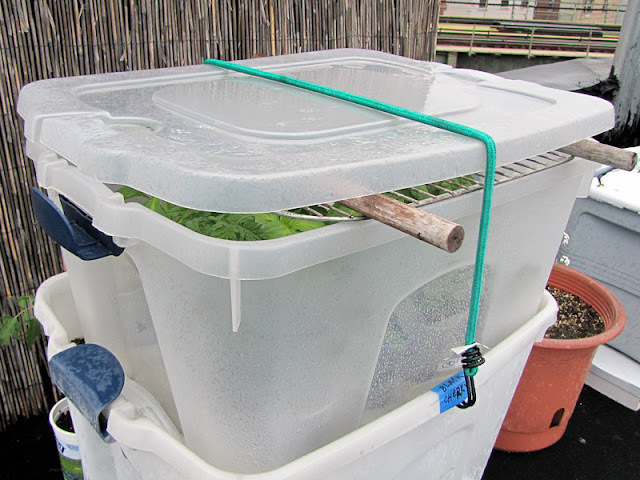 Hello :) Great Blog - very useful to a beginner like myself who is also documenting my journey in to container vegetables. Thanks for stopping by Aust, good luck in your 1st year! Wow, your seedlings look amazing!